It is 1746 when a mysterious young man arrives in New York and immediately goes to Lovell & Company on Golden Hill. He presents a bill for a thousand pounds, an enormous amount of money, from a trading partner of Lovell. Although the bill looks legitimate, Lovell insists on sending back to London for confirmation of the bill’s legitimacy before paying out. Perhaps Lovell would have felt more comfortable if Richard Smith was more forthcoming, but Smith has nothing to say about who he is or what he plans to do with the money. He is, in fact, dissembling in some way, but we don’t learn how for some time. These are uneasy days in the colonies. The governor is not popular, and he is constantly undercut by Mr. De Lancey, who has better connections. Most of the New Yorkers are very touchy about anything that seems to threaten their liberty. Smith himself is the type of person who rubs others in the wrong way. He is also hapless. Within no time, he has been robbed of almost all his money and has to subsist on a few guineas until the bill clears. At the same time, he must present a facade of wealth to all the curious New Yorkers. On Guy Fawkes Day, he accidentally offends a gang of laborers and is rescued by the governor’s secretary, Septimus Oakeshott. They begin an uncomfortable friendship. Finally, Smith has the misfortune to fall in love with Tabitha Lovell, a quick-witted, quick-tempered girl who seems to hate him. The novel is written in a humorous, sprightly style, and we don’t find out who the narrator is until the last chapter. We end up with a picaresque adventure story that has a hidden purpose, and hints of more important issues. 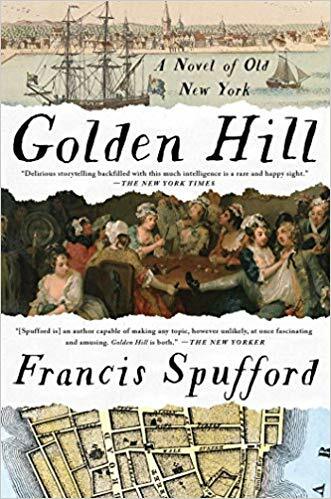 Golden Hill is an excellent historical novel that I read for my Walter Scott prize project. It depicts the beginnings of English New York with its solid Dutch background, hints of the coming revolution, and looks at the issue of slavery. It is entirely unpredictable and highly enjoyable. 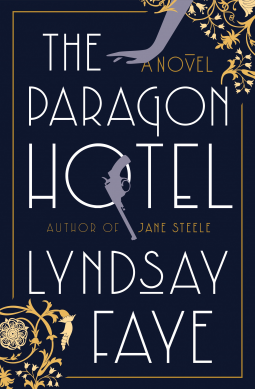 Alice “Nobody” James is on the run from the Mafia with two bullets in her at the beginning of The Paragon Hotel. She is obviously in distress when her train arrives in Portland, Oregon, so Max, the African-American railway porter, takes her to the Paragon Hotel. The hotel is the only one in Portland for respectable Negroes in the 1920’s, when this novel is set. In fact, it is illegal for them to even live or work in Portland. Alice is grateful for the help, and soon after recovering gets to know some of the residents and employees of the hotel. In particular, she is drawn to Blossom Fontaine, a chanteuse who reminds her of a friend she had in New York. 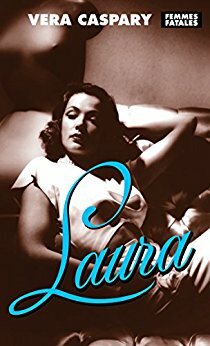 When Alice finds that the occupants of the hotel are worried about the Ku Klux Klan, newly arrived in Portland, she decides to help them with her skills in investigation—for she was a spy for Mr. Salvatici, a man known as the Spider, back in Little Italy. As Alice and her new friends prepare to battle bigotry, a little boy disappears. The novel follows the search for the boy while flashing back to explain how Alice ended up being wounded by her own friend, Nicolo Benemati. I have been a fan of Lyndsay Faye for a long time, but I did not find this novel as compelling as her others. I wasn’t interested at all in the Mafia story. I was more interested in the Portland story, but somehow the characters didn’t ring true to me, particularly Alice herself. Faye seems to have written this novel to explore Portland’s long racist history, which I found interesting, but it gets off track onto other issues. Sometimes a wrong detail will bother me so much that it detracts from my enjoyment of a book. This happened from the beginning of The Edge of Dreams, from Bowen’s Molly Murphy series, when Bowen’s heroine Molly and her baby son are caught in a train accident and she cracks some ribs. The plot requires Molly to have someone else take care of her baby while she investigates crime—that’s the only obvious reason for this incident until late in the novel—so her husband, Daniel, asks his mother to help. Bowen has evidently never had cracked ribs, though, or she might have picked some other ailment. My husband has, and he says it hurts so much that all you can do is lie there and cry. Although Molly remarks that it hurts to breathe, she clearly doesn’t understand what this means and gets out of bed almost immediately, begins calling on friends, and investigating crime. This mistake was irritating as the novel continues to mention Molly’s injury while she takes trains and travels all over New York City. Daniel is investigating a series of crimes that at first are linked only by letters Daniel receives at the police department. In fact, some of the incidents had already been treated as accidental. But the killer promises to continue. Molly is more interested in the case brought to her by her friends Gus and Sid. A young girl’s parents were burned to death, and she was found asleep outside with no memory of what happened or any sign of having been near the fire. An eager young police lieutenant thinks she killed her parents. 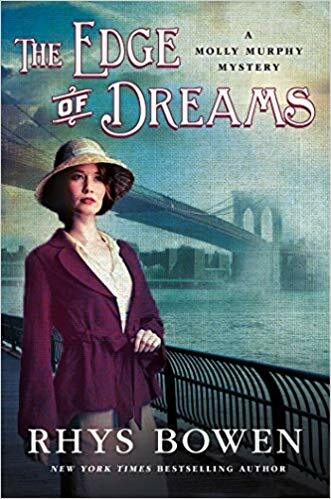 She is having nightmares, and Gus thinks an alienist skilled in the interpretation of dreams can help her. Predictably, the cases prove to be connected. I was well ahead of the book’s sleuths when it came to identifying the murderer, if not the murderer’s identity. If you think I wasn’t exactly charmed by this mystery, you’d be right. Aside from a slew of rather flat characters, it has such a ridiculously unbelievable solution that I didn’t buy it at all. In 1957 New York, Ellie Shipley is a graduate student in art history who also does restorations. A contract for restoration work asks her to make a copy of a 17th century painting, “At the Edge of a Wood” by Sara de Vos, her only known work, for the owner. Soon, however, Ellie understands that she is creating a forgery, but she is too interested in the work to stop. Marty de Groot, the painting’s owner, notices that his painting has been stolen. He determines he will find out who took it. In 2000 Sydney, Ellie is now a respected academician and museum curator. 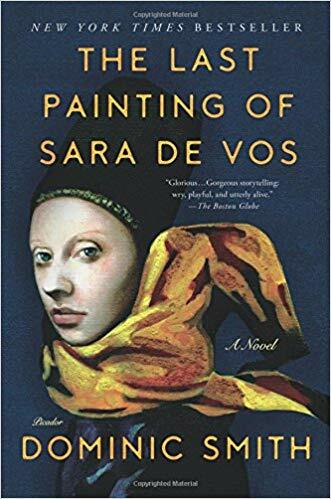 She has discovered that both of the de Vos paintings, the original and the copy, are being sent to her museum for an exhibit on 17th century Dutch women painters. Now, after 40 years of strict integrity, she is afraid her past is catching up with her. Although I found the story interesting, I was not at first that involved with this novel. Soon, however, I was totally captivated by all three stories. 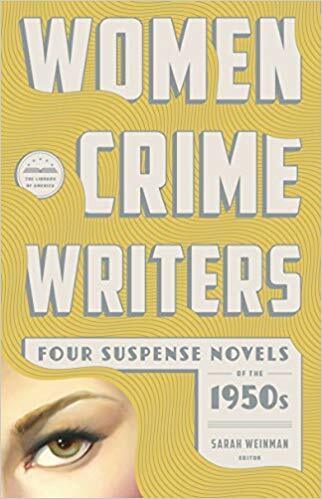 At first seemingly a crime novel, it goes much deeper. I really enjoyed it. 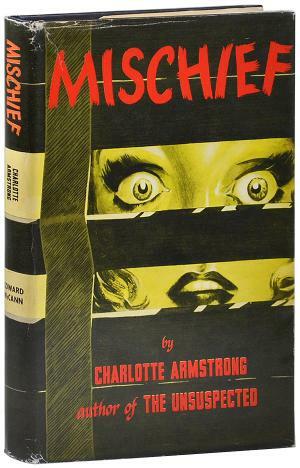 Mischief by Charlotte Armstrong is the first novel in the 50’s volume of my Women Crime Writers set. It is an excellent start to the second volume. Ruth and Peter O. Jones are in New York for a convention at which he is a speaker. Because Peter’s sister cancelled her babysitting gig at the last moment, they have had to bring their nine-year-old daughter, Bunny, with them. The elevator man hears them talking about where to find a babysitter and volunteers his niece, Nell. Once Ruth and Peter leave, though, Nell begins to behave strangely. Jed Towers is on his last date with his girl, Lyn, before moving across country to take a new job. They have a spat, however, and Lyn walks out. Jed goes back to his hotel determined to find another date for his last night in town. Across an open courtyard, he sees a girl in the opposite window, who seems to be inviting him over. I can’t say more about this novel without giving away the plot. Suffice to say, it builds up a great deal of suspense as one guest after another starts to worry about what is going on in that room on the 18th floor. 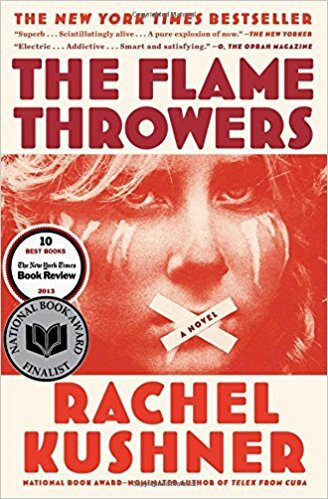 Set in the mid-1970’s, The Flamethrowers evokes two distinct but frenetic movements. In New York, it is the art scene, where performance art is coming to the fore and artists are trying to live their art. In Italy, it is revolution and the Red Brigade, where common people are rising up against business and political corruption. The heroine, Reno, has grown up in Nevada ski racing and has a fascination with motorcycles and speed. She moves to New York to become an artist (although we never see her making any art) and eventually becomes the girlfriend of Sandro Valera, a well-known, older artist. Sandro’s family in Italy made its money in motorcycles and tires, and when Reno travels to the Great Salt Flats to do a time trial on her Valera motorcycle, she accidentally gets involved in the family business. As a result, Sandro reluctantly brings her to Italy during a time of great instability and confusion. Kushner evocatively depicts both the New York art scene and the seething streets of Rome, although often the artists seem like poseurs to me. I don’t think the depiction is meant to be satirical, though. However, Reno as observer seems to be a different person than the risk-taker who went to New York. Further, the narrative, which occasionally jumps to the story of Sandro’s grandfather, who started the company, feels disjointed and as if it doesn’t really add up. Although I was entranced by long passages of this novel, I ended up wondering what it really was about. In particular, the novel relies on Reno’s relationship with Sandro to tie it all together, but that relationship is barely touched on. This is the first book I read specifically because it is part of my James Tait Black Fiction Prize project.